Do no harm, of course. But when it comes to decorating decisions, especially those that prove ephemeral, personal preference is your guide. Let’s look at some approaches. 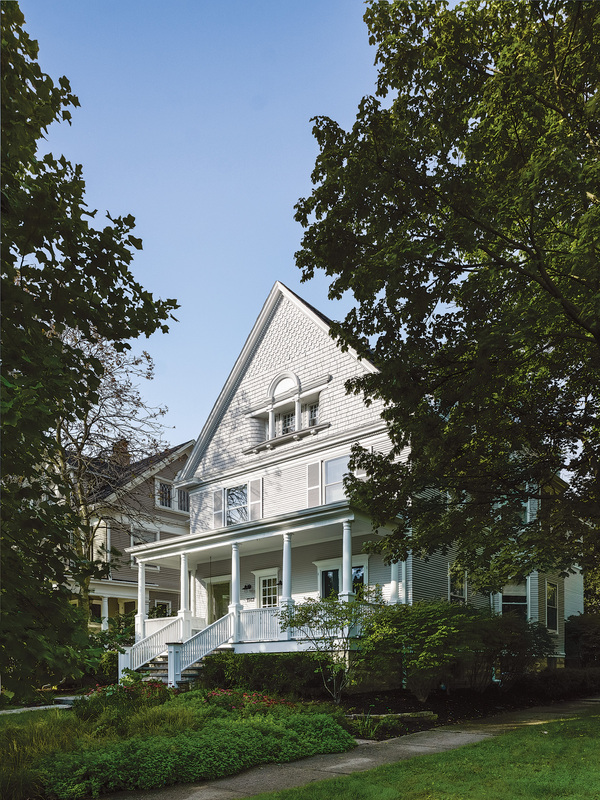 The Queen Anne/Shingle Style façade was restored after an unfortunate 1980s redo. Twenty years ago, I was the slacker: my (old, restored) house was not pure. Never mind the overflowing presence of kids’ electronics, we even bought a sofa from a catalog! Amid butler’s-pantry inspired cabinets, the refrigerator was in plain sight. 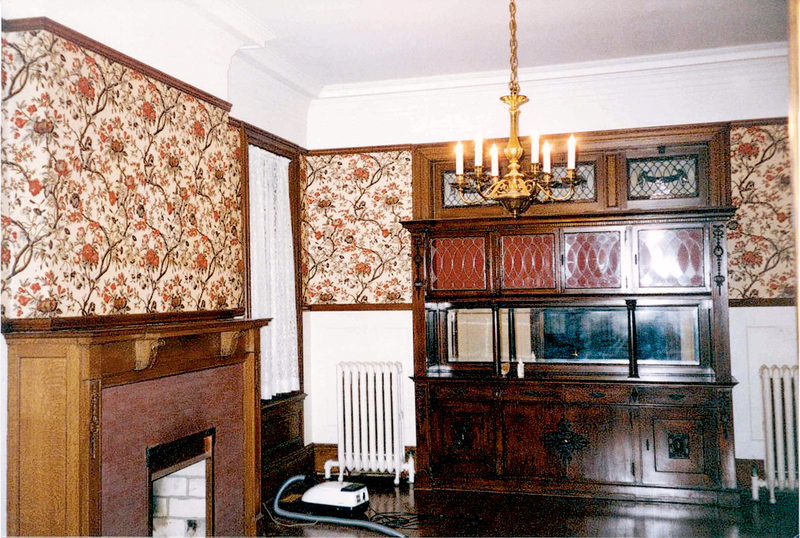 Through the Victorian and then the Arts & Crafts revivals, period rooms were the gold standard for restorers. It has occurred to me that a next wave of old-house owners, however preservation minded, doesn’t necessarily want the fuss or expense of Victorian Revival interiors. Today’s homebuyers have their own tastes, and many find themselves in mid-20th-century houses. At the same time, others are simplifying and downsizing. I enjoy historic interiors well decorated in a manner spare or eclectic—as long as folks don’t buy an intact older home and then rip its guts out. Much of our old housing stock holds materials now rare or costly; it’s filled with magnificent craftsmanship—and our cultural history. Thou shalt not destroy good old work. Respect the excellent materials and craftsmanship that survives. Realize that as details are altered over time, the character of the building is changed. Repair rather than replace whenever it’s possible. To thine own style be true. The building represents a particular time and design. Learn about it so that your changes are compatible. The 20th-century proclivity to turn Victorians into Colonials, for example, did not work; stripping these houses and painting them white only succeeded in making them ugly and very expensive to restore. New work, from repairs to additions, should enhance and clarify the original design intention, or at least not detract from it. Compatible trim and details don’t fight the clean decorating scheme preferred by the current residents. The original façade was handsome until a remodeling cheapened it with an ersatz door surround, spindly rails, and a curious bump in the porch roof. Its original dignity has been restored. Worse was the face on the rear addition, which bore no resemblance to the facade. 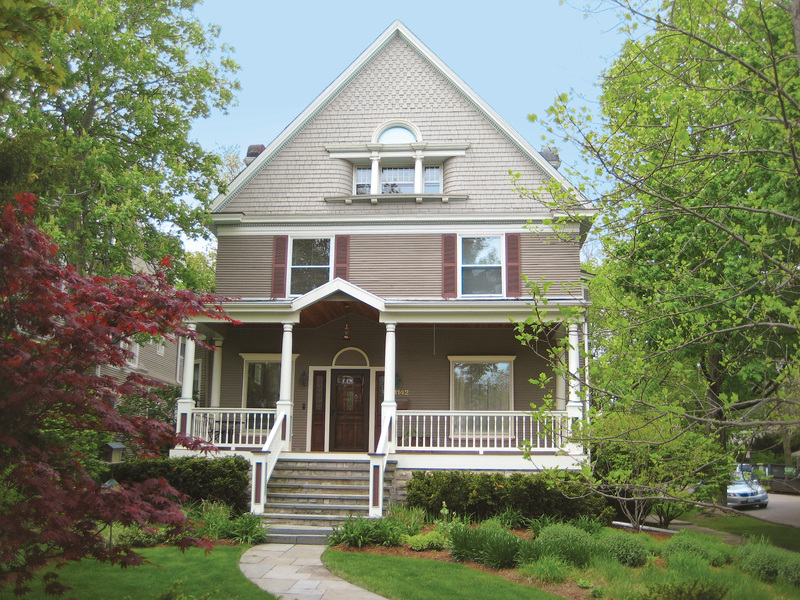 It has been rescued with harmonious claddings and windows, and a deck with period millwork. As a before-and-after story, says architect Stuart Cohen, “This one shows there’s always hope!” Stuart Cohen and Julie Hacker of Cohen & Hacker Architects note the 1890s Free Classic Queen Anne house in Illinois had been botched during a 1980s remodeling, when the interior was largely denuded and “opened up.” The front porch had been altered awkwardly with stock lumber and an ersatz vinyl “Palladian” entry that took away from the original Palladian window in the shingled gable. • Restore the façade to authentic period style and proportions—fixing the entry door and porch roof line, adding appropriately sized wood shutters, and replacing the 1980s columns and balustrade. and addition to be compatible with the façade by replacing under-scaled windows, and matching horizontal banding and cladding materials. Alluding to traditional design, add a compatible deck and a stairway to the backyard. • Bring back the interior with an eye to restoring proportion to the rooms, respecting conventions of the period and the original elements that remained—and yet honor the client’s request for restrained, uncluttered space. The newel post and leaded window are original. 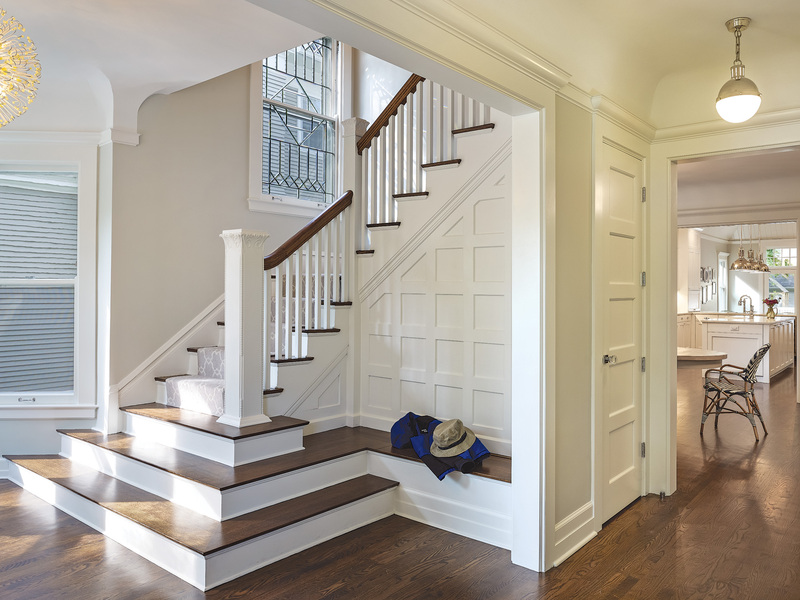 Wood trim, period-inspired coved plaster, and a modern take on a stair bench are new. 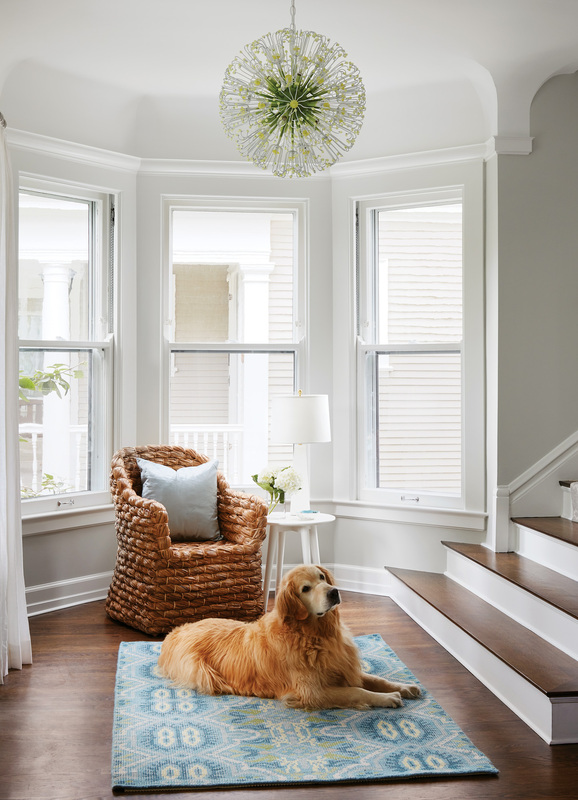 New period-inspired details include coved plaster at the ceiling, articulated door and window trim, substantial baseboards, and picture-rail mouldings. On the staircase, the original newel was retained, and the bottom treads reworked to suggest a period built-in, but with modern lines. The stair’s leaded-glass window is original. Pale, monochromatic rooms in this Victorian-era house retained proportion by way of trim, wall divisions, and size of fixtures. The clients—a young family with small children and a dog—preferred a fresh interior with contemporary furniture, not antiques. Their decorating approach is minimalist. 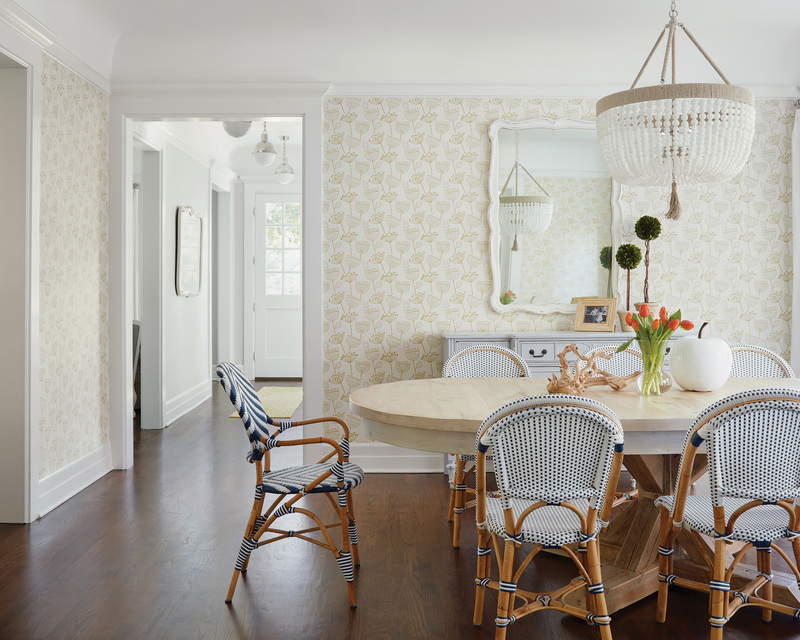 Once dignity was restored to the house, interior designer SuzAnn Kletzien deftly helped the family choose lighting fixtures, furniture, and even wallpaper that work in the space. The result is a calm, pleasing interior easily adaptable to changing tastes in the future—even, perhaps, a more historical treatment. Paint colors and furniture are, after all, ephemeral. The addition of Victorian Revival roomset wallpapers contributes complex color schemes, pleasing proportion, and a period sensibility. Victorian homes do present a challenge. Bungalows and ranches were designed with still-familiar 20th-century layouts and amenities. Victorians, however, were built in a different era, when central heat may have been lacking and servants used the kitchen. Updating them takes special sensitivity. Furthermore, they may be full of ornamental plaster, pocket-door mechanisms, stained glass, and so on—all of it now 120 or more years old and needing work. That’s why Victorians too often are gutted or remade. The concept of stewardship says the house came before you and will be here when you’re gone; you own it only temporarily; you owe something to the future. Though stewardship rarely comes up in the world of real estate, homebuyers often embrace the idea once introduced to it. Nevertheless, many people who appreciate history and architecture don’t want to live in a Victorian aesthetic environment. Balancing stewardship with personal taste may seem like walking a tightrope. Understanding the difference between what is permanent (ripping out the main staircase) and ephemeral (painting a bedroom blue) is critical. It’s not always so clear, of course: painting woodwork of fine wood that retains its original natural finish comes to mind. It’s reversible, but only with pain and suffering, and environmental cost. If the woodwork was already painted when you got there, carry on. But try not to be the first in 130 years to slather latex over old-growth hardwood that once set the entire tone of rooms! I’ve often relied on these other guidelines: Live in the house for months, or a year, before making any big plans. Clean it first; whatever “it” is may be salvageable. Don’t take the first contractor’s word for it. Don’t alter the architecture itself. Use personal taste in paint colors, wallpaper, textiles, and furniture. Preserve and store original fittings, such as light fixtures and even a built-in, if you replace them during your tenancy. The chateauesque house was built in 1897. Such fine, bold architecture demands an informed approach to renovation. 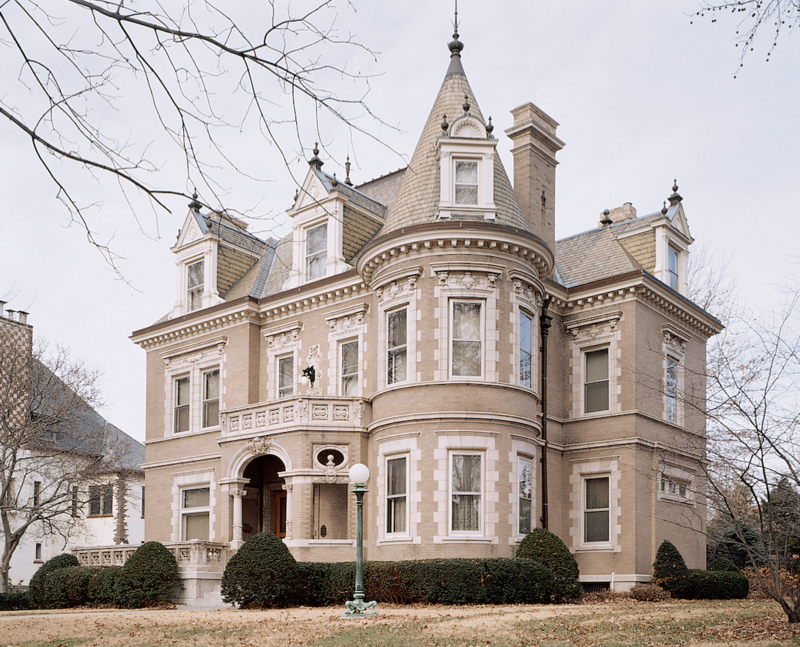 Buy a chateau, and you may find your taste changing, as it did for the owner who restored this 1897 house in St. Louis. The interior boasts a massive and ornate staircase of quarter-sawn oak, several fanciful fireplace surrounds, decorative plaster and fine woodwook (never painted)—all worth saving, regardless of the decorating approach. But uninformed choices can turn even a refined interior into a white (-painted) elephant. The “before” pictures show rooms stripped to the point that all proportion was lost (or, in the dining room, turned upside down). 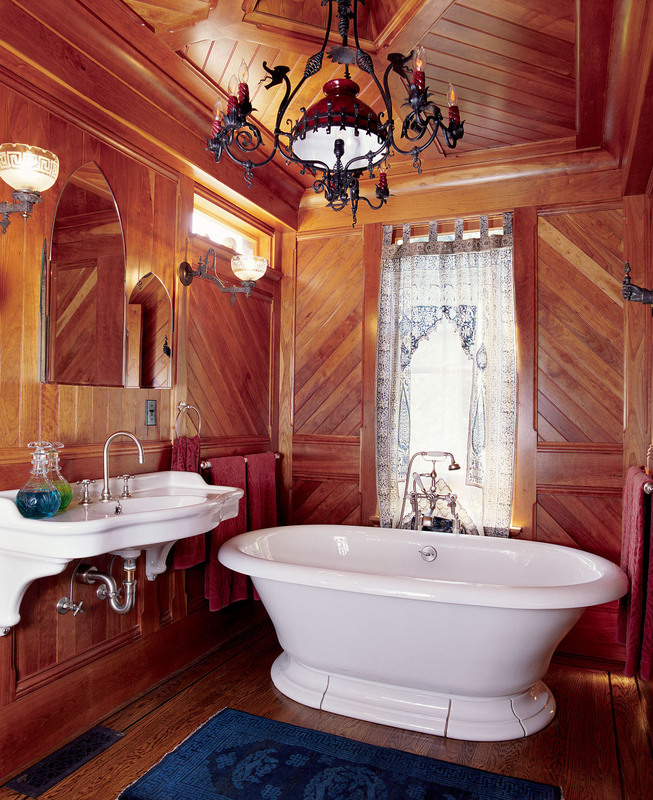 Against unrelieved white walls and ceilings, the sumptuous woodwork appeared heavy and dark. Decorating may approach museum quality in a revival scheme that allows for modern systems, energy efficiency, and updated kitchen and baths. 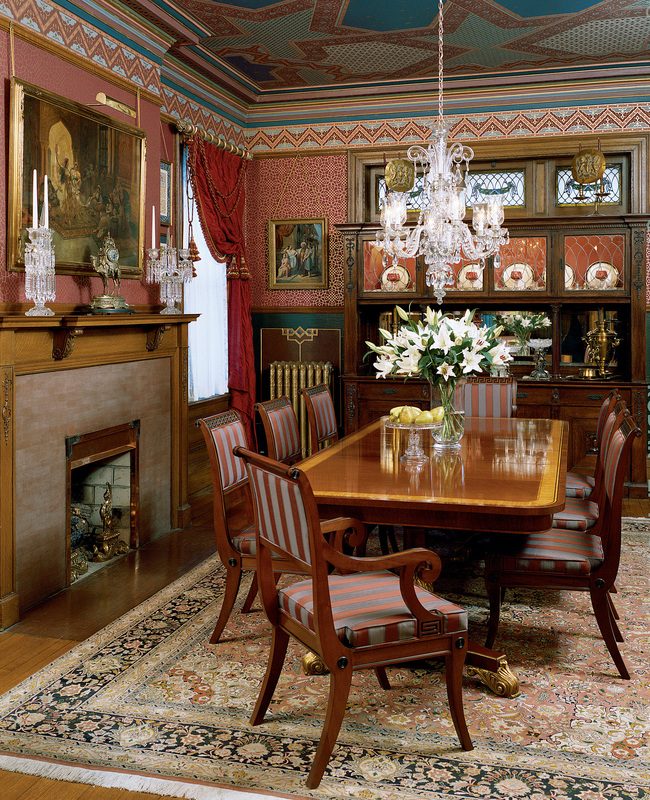 The owner understood the luxury of having high ceilings and big fixtures, like the mantels. Wall division lends proportion that humanizes the scale and draws architectural elements into the scheme. In his extraordinary scheme, the owner blended neoclassical, Victorian, and Colonial Revival design elements, just right for 1897. Furnishing with antiques and period drapery edges toward a museum approach in these main rooms—but with Victorian Revival-style cleanness and color sense and a more contemporary furniture placement. The renovated kitchen in this house defines a revival approach—period-inspired, but unabashedly modern in function. The dado treatment on the bottom section of wall lowers the apparent height of the room and provides emphasis for mantels and furniture. 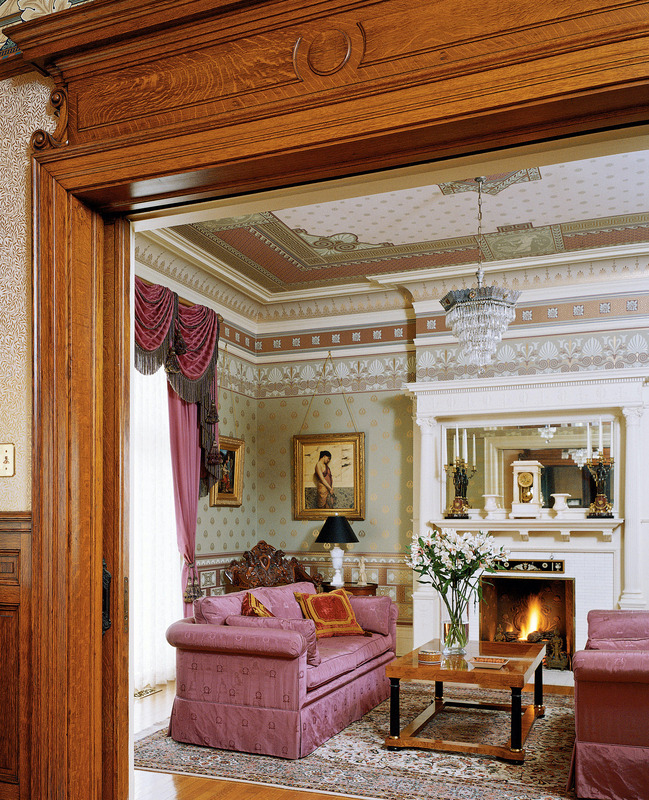 The frieze (or border at the top of the wall) creates a transition to the ceiling. By tying together the motifs of the walls and echoing carpet colors, the decorated ceiling completes the “jewel-box” effect that brings human scale and delight to the room. With less stark contrast in the study, the woodwork went from forbidding to warm, and the space from rambling to cozy. The desk in the tower is a nice touch. Make note of wall divisions, ceiling height, volume—and don’t fight the architecture. 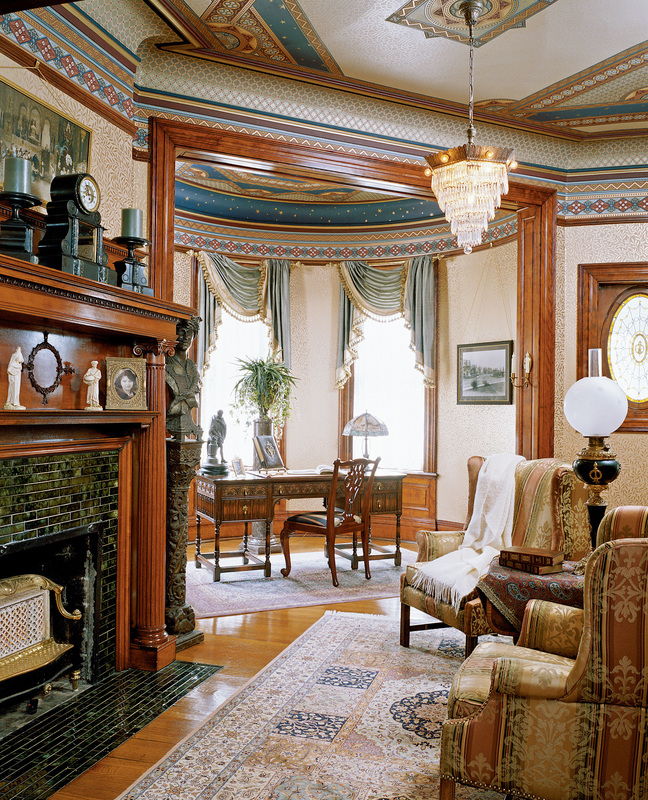 Victorian rooms, especially those with high ceilings, were brought to human scale with such embellishments as picture rails and dadoes, overmantels, and large fixtures. Walls painted in one color, top to bottom, lose all scale, and the white elephant is born. Even a delicate, monochromatic scheme can restore proportion. 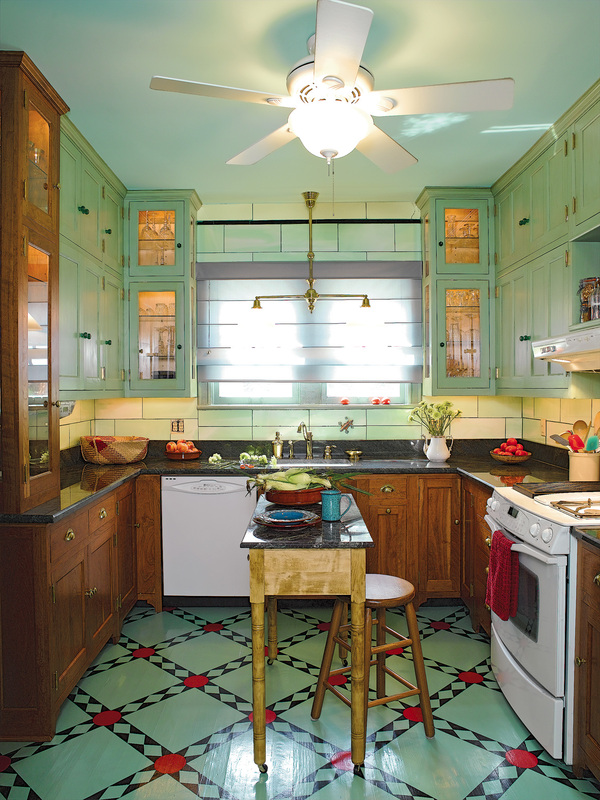 Most renovators end up mixing several philosophies. 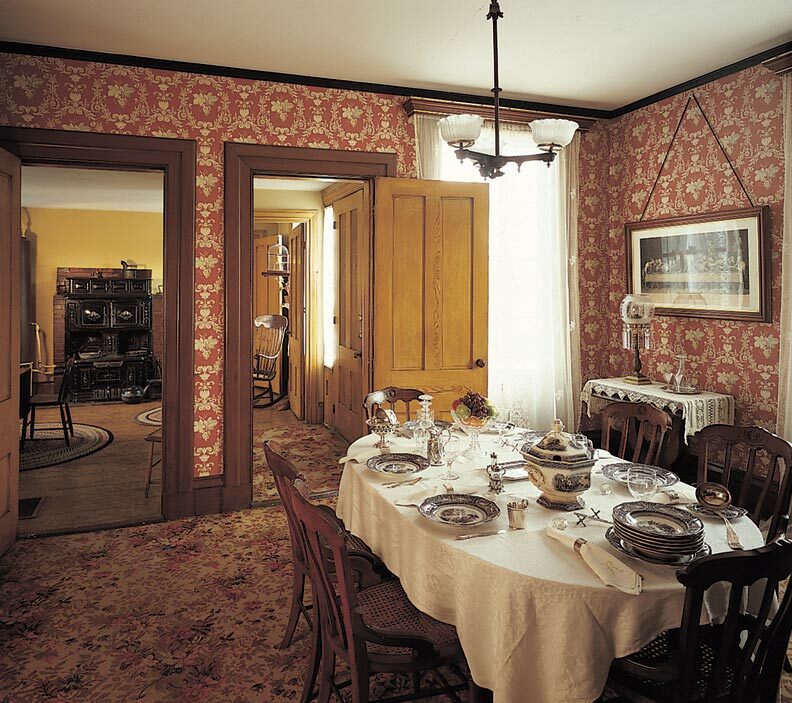 Museum Quality A purist approach seeks to bring house (or room) back to a certain time, without visible anachronisms—no microwave oven, no TV—using only period materials, furniture, and decorating styles. Some restorers (like curators) are forensic, using research and on-site discovery to bring back what truly once was. Victorian Revival Sometimes this moves into museum territory, but generally it’s a more relaxed approach that allows for modern function and sensibility. With paint instead of wallpaper, simplified window treatments, and less furniture, some revival interiors are pared down and yet follow conventions from the house’s period. Sympathetic Refresh This approach honors the house: original elements are retained, though some renovating may take place. Repairs and additions are in keeping. Decorating is by personal choice; furniture may be modern or eclectic. Even if decorating is period-inspired, there’s probably a sectional and a flat-screen in the TV room. Contemporary An easy choice for houses with simple (or previously modernized) interiors—but even ornate rooms can become “galleries,” a background for contemporary furniture and objects. Pared-down decorating can even draw attention to, say, stained glass and plaster medallions, which become vintage art on display.